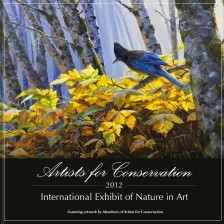 Honours & Accolades - Mark Hobson • Coastline Art Inc.
Artists For Conservation announced that Mark's "Steller's Jay: Among Alders" painting has been selected for the cover of the 2012 Art of Conservation Exhibit Book. The annual hardcover "coffee-table" book is published on sustainably forested paper, as a companion to the 5th annual AFC Exhibit, showing in Vancouver, B.C. running October 13th thorough to October 21st. The artbook, which can be ordered online, features images of all the art on display at the 2012 AFC Festival and virtual show. 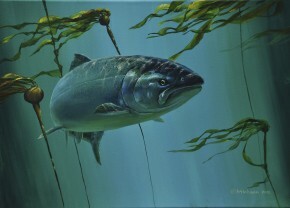 The orginal has sold but this stunning piece is available as a limited edition giclée reproduction. 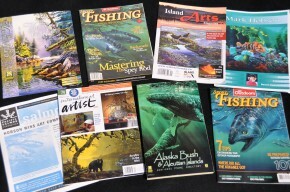 "There are hundreds of outstanding artists within the ranks of the AFC whose work I have long admired, and so I am deeply honored to have my work chosen to grace the cover of the 2012 AFC annual publication," says Mark. 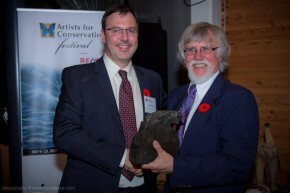 AFC President, Jeff Whiting explains: "Mark is a long-time supporter and member of AFC and an exemplary leader in our community, having dedicated his life to communicating the beauty of our natural history and leading important conservation initiatives to protect iconic natural areas. 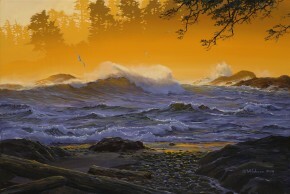 His artwork is visually stunning and captures the natural essence of Canada's Pacific Northwest habitat." Mark is currently championing the protection of Canada's west coast wilderness, having envisioned and organized an expedition with fifty artists - some of Canada's most celebrated and many of whom are of First Nations heritage. His efforts are bringing attention to the dramatic beauty and fragile diversity of the remote coastal wilderness of northern and central B.C. that would be at risk with proposed super-tanker traffic through rough and perilously narrow channels. Eight fellow Signature Members of Artists for Conservation participated. In January 2008 The Royal Canadian Mint launched a new Canadian coin designed by Mark Hobson. 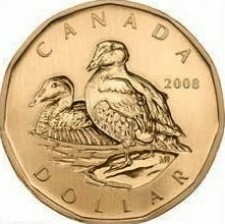 This new aureate dollar features a pair of Common Eiders, a duck species frequently seen on the east coast of the country. It is available as a specimen set with six other Canadian coins presented in a maroon coloured case and limited to 40,000 worldwide. Most post office outlets have the new coin on display. This is the fourth wildlife design Mark has done for the Royal Canadian Mint. Previous images included Tufted Puffins, Pronghorn Antelope and Muskox. 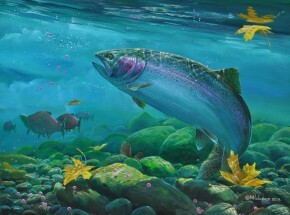 Two of Mark Hobson's images were chosen by Ducks Unlimited Canada for the National Art Program for 2006. The artist’s proofs of the chosen images are available from the artist. 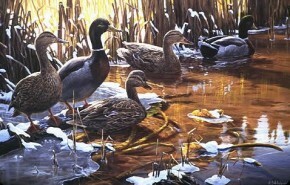 "Mallards: Looking South" was awarded the 2006 Artist of the Year award. "Polar Bear: At the Edge of the Ice" was chosen for the Portfolio Artists Category. 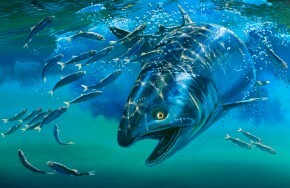 The Canadian Wildlife Conservation Organization chose two of Mark's images for its 2006 Stamp Program for fundraising efforts. 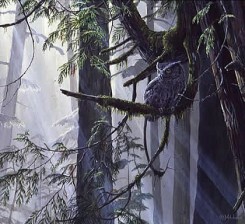 The images chosen were "The Screech Owl" for British Columbia and "The Common Snipe" for Nova Scotia.